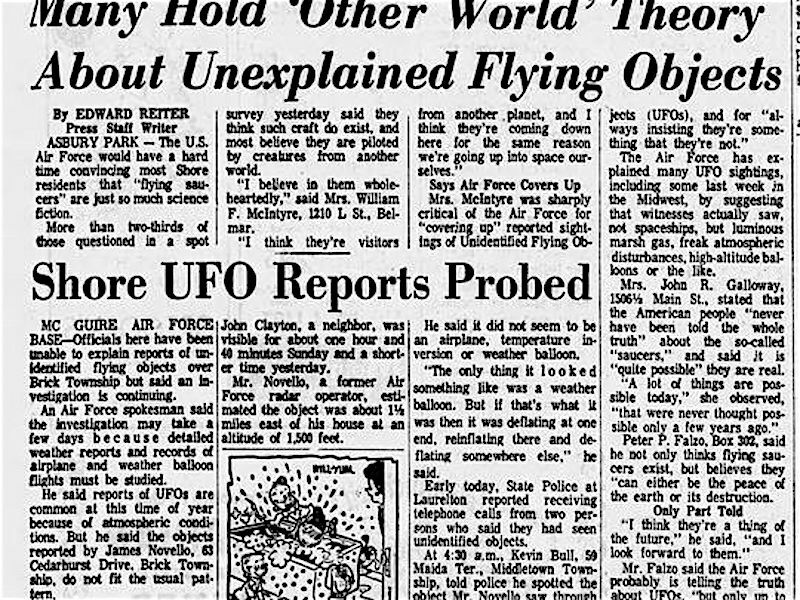 UFO IV --- Below - Mid Page - are videos concerning UFOS = legit sightings & hoaxes, near bottom film/tv 1950s - 1960s UFOS. 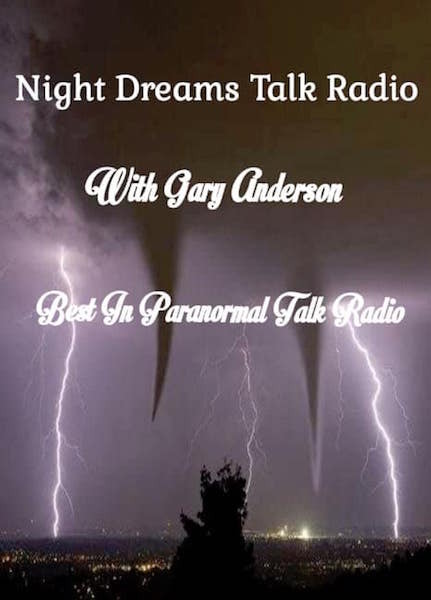 UFO sightings and accounts range from bold lies with great imagination to legit happenings with evidence. 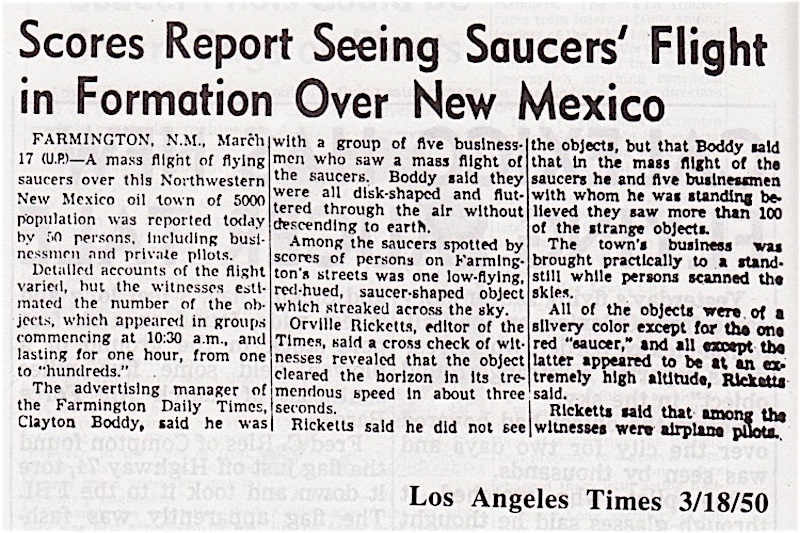 It seems UFOS --ALIENS -- THE MYSTERIANS have been visiting Earth since the days of the ancient Sumerians, however since the end of Word War II Flying Saucer sightings or close encounters with star beings have become not so uncommon. 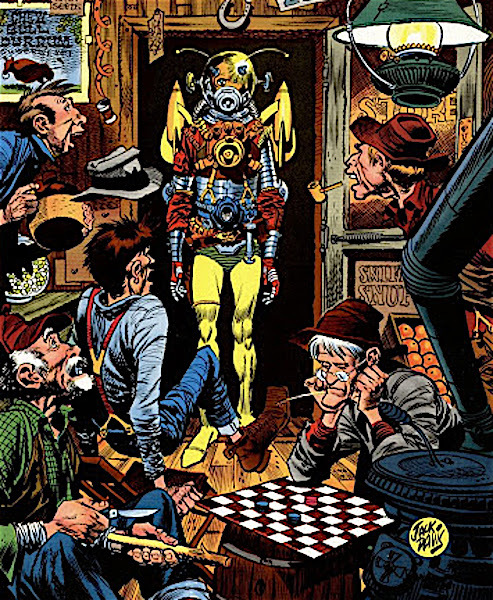 The question still is, what do the Aliens - Mysterians want? Below: Not a hoax, a spacecraft from planet X did land outside of Socorro, New Mexico in April of 1964. The incident was witnessed and pod (SUPPORT) marks were found, where the ship landed. In the area of where the craft was sighted, burnt brush was found, the shrubs had caught fire by way of the alien vessel's propulsion unit. 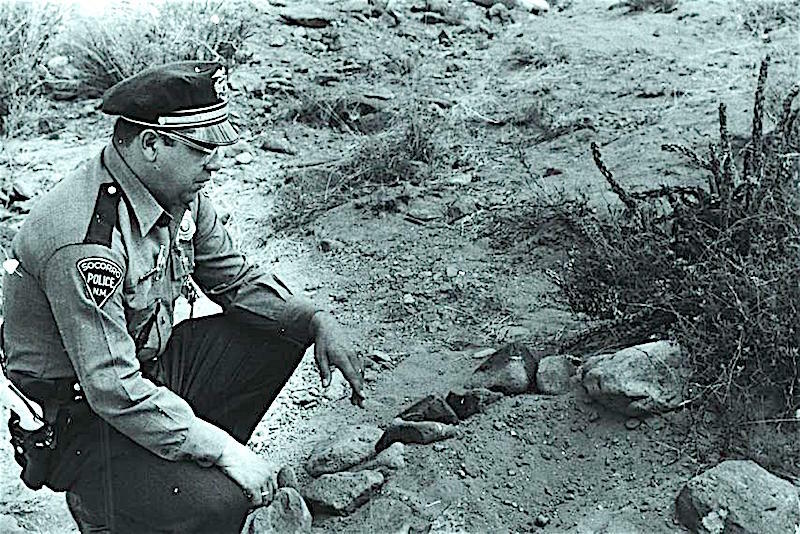 BELOW: New Mexico Stape Police Officer Lonnie Zamora who witnessed the event examines one of the pod prints that the spaceship left. Below: Left - Bill Nye is a egotistical paid DEBUNKER, his reasoning is none, he is a close minded media hog. However he can be a funny comedian at times, the Video on the Below Right I have my doubts -- by DANIEL FRY 1964 OREGON, I think it is a fake. The LONNIE ZAMORA incident was not NOT NOT a FAKE, it was legit. 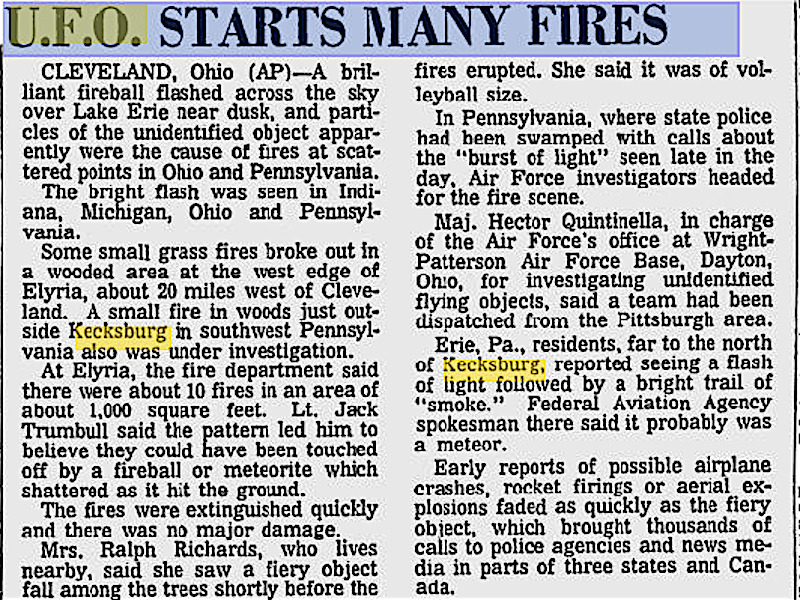 Below + Below; Articles about a UFO that went down outside of KECKSBURG, PA in December of 1965... Yes this was another legit sighting, a true event. SECTION BELOW --- Four videos that concern themselves with UFOS --- legit and hoaxes. 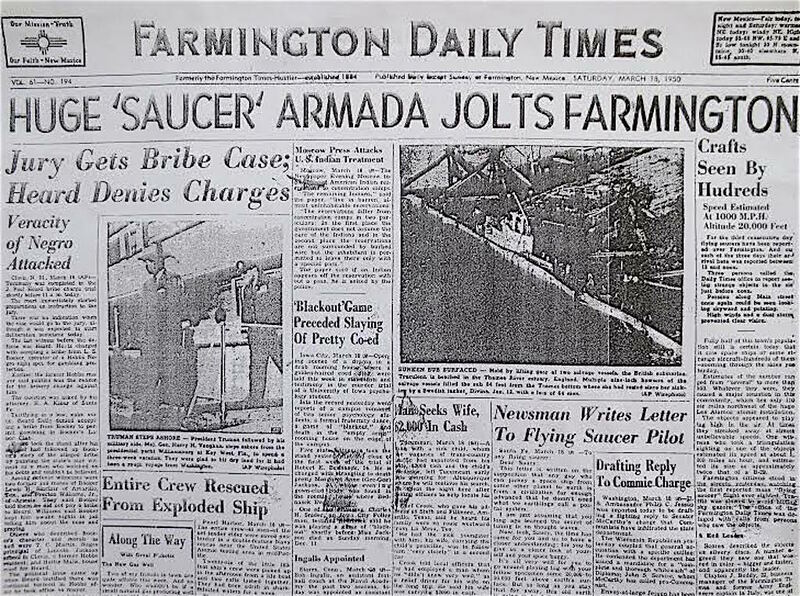 The Below video is proof that UFOs were visiting Earth before World War II... 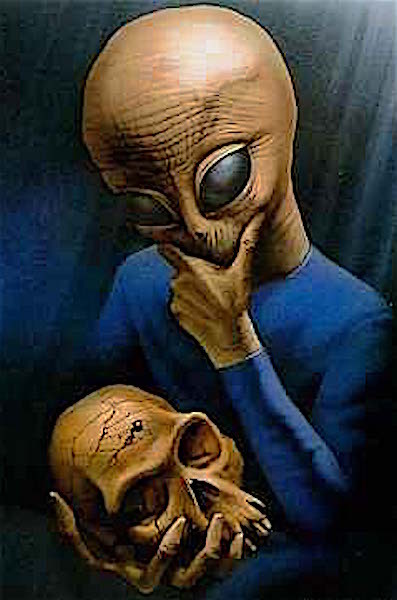 However since the end of the war and the advent of the Atomic Bomb, UFO activity has drastically increased over the USA. 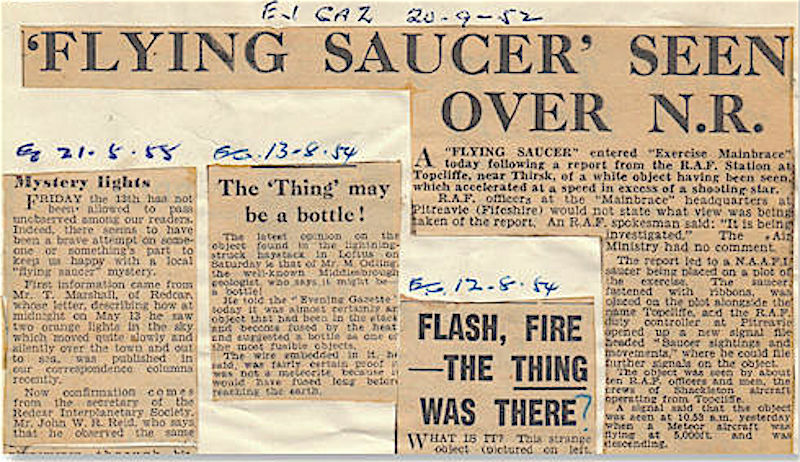 BELOW = UFO hoaxes & legit photos of flying saucers. 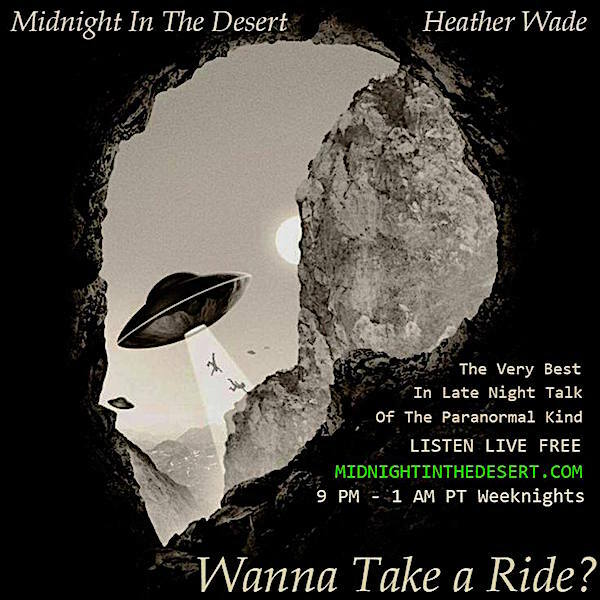 BELOW: UFO abductee tells his story --- by way of a 1960s game show --- "TO TELL THE TRUTH" ---- the abductee Barney Hill --- his story is legitimate -- he and his wife Betty were abducted by Mysterians in September of 1961. _________________________ __________________ In Allan Pacheco's book --- "MYSTERY-MAYHEM: CHRONICLE USA" 3rd Edition, there is a section on this abduction -- you can get the book on Amazon or hit the order button on the left side of the screen and order the book from Al Pacheco. BELOW: Interesting video from Turkey --- of perhaps a wing or delta shape UFO --- in the video ----- it does look like one can see the cockpit area of this alien vessel. 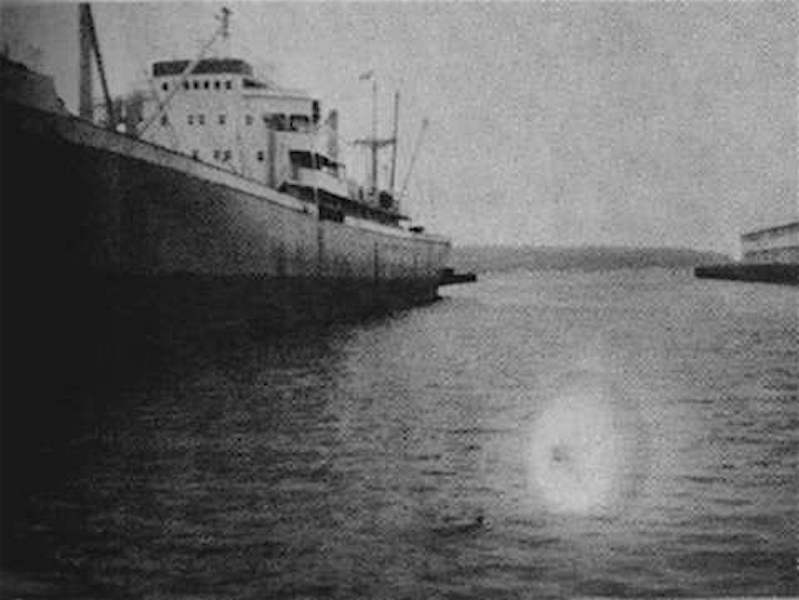 BELOW: Supposed UFO photo --- there is not a lot of info on this snapshot, it is reported to have been taken in 1966 in Seattle. Allan could be %100 wrong but he thinks the supposed alien craft -- looks like a droplet that dried on the negative during film development. Above and below ---- from different countries and different decades --- Alien craft have been sighted --- what does this portend --- are there different civilizations watching Earth, what is the end game? 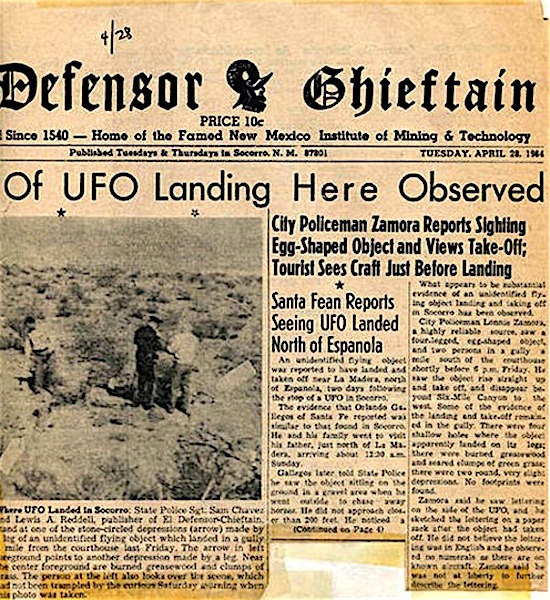 ABOVE & BELOW: New Mexico through the decades -- since the 1947 Roswell incident, has been the scene of UFO waves... 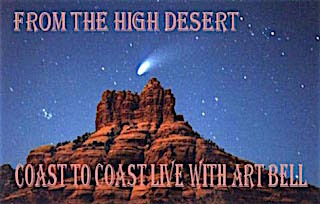 Even in contemporary times -- New Mexico --- specifically the Santa Fe area ---- on occasion has become a hot spot for UFO --- ACTIVITY. 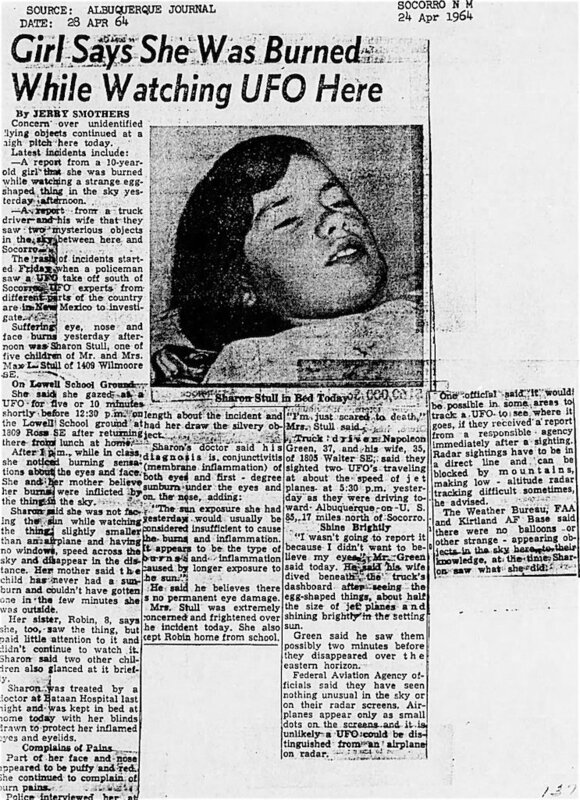 UFO SIGHTINGS, ARE THEY LINKED TO CATTLE MUTILATION PHENOMENA?